Disney announced its fall 2018 cruise schedule today, with the Disney Magic set to sail to Bermuda five times next year from New York City. The Disney Magic Bermuda Calls will be on October 6, 2018; October 15, 2018; October 21, 2018; October 26, 2018; and October 31, 2018. Each of the Disney Magic sailings includes two full days in Bermuda, while the October 15 sailing includes three days in Bermuda. Chief Product and Experiences Officer Pat Phillip-Fairn said: “The Bermuda Tourism Authority is thrilled to partner with the iconic Disney brand to expose a new segment of cruise travellers to our island life experience out here in Bermuda. It’s the first-ever time Disney Cruise Line has come to Bermuda, so naturally we’re excited about these inaugural calls. “Disney cruise vacationers and the new experiential travellers now discovering Bermuda are very similar in that they want to see, taste and experience everything Bermuda has to offer. The BTA said, “The Bermuda Tourism Authority’s product and experiences team will work closely with Disney to create and promote unique port experiences for Disney passengers. The goal is to provide new opportunities for tourism industry entrepreneurs as the island heads into the shoulder season. 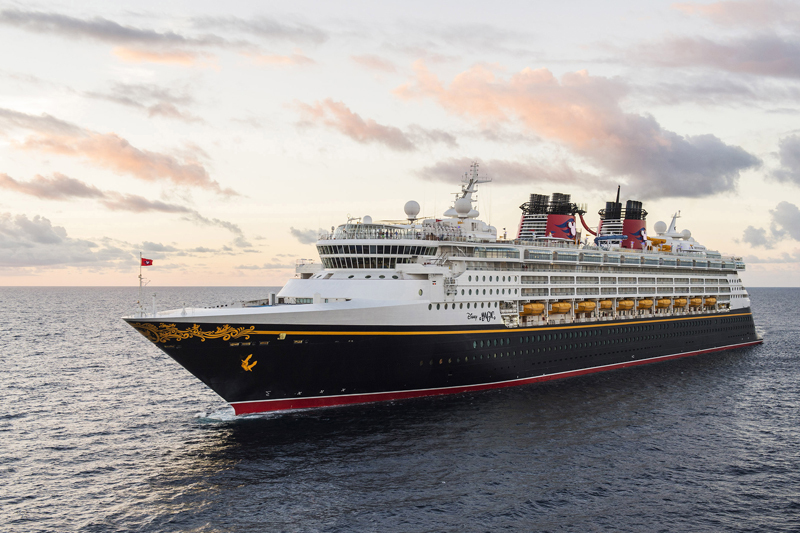 “The Disney Magic calls are significant because they help lengthen the visitor season into the fall which is a major objective of the government and the Bermuda Tourism Authority,” said Minister of Tourism, Transport and Municipalities Michael Fahy. “At Disney, we love to create magical vacation memories for our guests, and Bermuda is without a doubt a wonderful setting for memory making,” said Tom Wolber, senior vice president, Disney Cruise Line operations. Disney Magic carries up to 2,713 passengers and 950 crew. She is 984-feet long and will berth at Dockyard when she visits Bermuda. Slow down some you guys the opposition needs to catch up! Just crossed a raging river of tears to get home. The river source is claimed to originate from Alaska Hall. I sense some Disney Twizy’s in our future! Come on Preserve Marriage – there are married animals on that boat! Please save us from the spectacle of seeing mice and ducks holding hands and kissing!!!!!! Look how many of them run around with no pants on!!!! A huge demonstration is needed. Can’t have this in Bermuda. Cruising during September and October comes with one pretty big caveat….Hurricane! November or December would be better when the island is in slow season. These are most likely the transition cruises, the period between when these cruises service the east coast and Caribbean before moving over to the Mediterranean. I have long believed we should target these cruises for stop overs as they go. With this move, the BTA may actually score additional visits in the regular season in future schedules, it is a good opener for new cruise lines to here. The BTA is killing it these days. Indeed……this is good for Bermuda. We have to think ‘generationally’ for our economic recovery. Without the in depth planning that forecasts into the next 2 decades we will lose out. All the other islands are developing their product and Bermuda is still trying to be this colonial outpost that attracts tourists. we need to “free up” and have two Hero’s Weekend type events on the calendar annually and maintain them. and all of our unemployed/underemployed fellow Bermudians will not be magically employed like some of the pundits would like to profess but at least we are on the road to recovery…. Will have the opportunity to get a smaller piece of the pie but not the same amount as the HAVES. JUST LIKE THE FARMER RELIES ON THE RAIN TO NOURISH HIS CROPS – WE MUST NOT NECESSARILY RELY ON CERTAIN THINGS BUT MAKE THE MOST OF THE SAME THINGS WHEN THEY PRESENT THEMSELVES AND CREATE OPPORTUNITY AS IT APPEARS IS TAKING PLACE RIGHT NOW WITH THIS ANNOUNCEMENT…. 1000 plus people who spent half their savings coming to Bermuda for a couple of days and can’t swim because the water is too cold and just walk around that building up there that has a webcam and shows people in and on 5yh floor seaside balcony’s …………. You know people come here from Northern climes just for our winter weather right? October is still pretty warm too. Actually, the water temperature in October is a lot warmer than it is May and early June. The weather, however, could be a different story. Hmm, this is good BUT ….Disney equals Lots and Lots of Kids. The families who go on Disney Cruises will not be able to rent bikes/mini-cars and will be left relying on buses. As far as I know, buses will not accept strollers in Bermuda. But will my people get free cruises? TBH – I don’t see the big deal from a revenue perspective, but great that Bermuda is attractive enough for a 2 and 3 day stay from Disney! Side note: PLP be getting vexed at all the economic activity!! Current gov knows how to do it son! LOL So I read economic contraction, jobs losses, emigration, then Disney says they will make 5 calls and you sing siprana…And try to diss a political Party who reigned over the Biggest GDP growth in this countries history… I just can’t with YOU people. And also oversaw the largest economic contraction in our history as well. Want to talk about them overseeing the largest deficits as well? Your OBA has failed miserably, they are currently Governing and have been for the past 4 years. The PLP were voted out for meaningful change, this has NOT happened. Yeah, I know in PLP world the building up of hotels once again, increasing tourism numbers, halving the PLP’s monstrous $400mn deficit, attracting an international sporting event to our shores etc., constitutes failure. They haven’t failed miserably. They have actually don’t quite well despite inheriting the sh*t show that your green team left them and us (Bermudians) with. It is just your unbridled hatred for people that aren’t dyed in green which blurs your vision and affects your rational thought process. You , and others , just can’t stand the fact that we’re finally moving in the right direction despite the divisive and racial rhetoric from the PLP . They had their chance and they showed us exactly what they’re all about . And no-one with a functioning brain believes that they’ll be any different if they get back in again . You can’t seriously believe that we should go backwards again , do you ? Do you still want meaningful change? If you wanted change from the PLP why would you vote PLP now? Same crowd, same lack of any clue as to how to run the country. Quit trying to mislead people when the OBA do exactly what they want! Do they care about the people…clearly no! Rem that next election! All about self and trying to look good while selling the country!! What did the PLP do for you then? They *cared* about you? How? Fantastic news! When the time comes, let’s give Disney the huge welcome it deserves … as we anticipate a continuation of their welcome visits in the future. Disney Cruises have been knocking on our door since 2003, so yes you can thank the boys in green!! And you really believe this nonsense don’t you. Then when didn’t they let them in? Did the boys in green open the door? I am guessing not. Really, why didn’t they answer? It must be hard to be green right now, I still can’t stop laughing about the recession announcement yesterday! lol… so Easy Nahhhh, have you figured out why they may have waited until 2017 to act…. Don’t hurt yourself patting your boys in green backs…. only took 14 years later by your calculations. Oh sure. The PLP had them all lined up 14 years ago. Of course they did. If that were true, & a mighty big IF it is, why could the PLP with Mr Wonderful in charge of tourism not close the deal? Must have been another one of those dreams from the Magic Kingdom. Incredible!!! Here we have a big ship that has never been here before owned by a company that has never sent any ship here before & what do we get? Complain, complain, complain. Bermudians are like 3 year olds on Christmas morning. They get a good haul of gifts then are not satisfied. They want more, more, more & they don’t like what they got.